This wig for the character of Alice in "Alice in Wonderland" features long light blond hair that is perfect for the character. This wig can be used to complete your Halloween costume and is of theatrical quality so that it can be used for theatrical performances as well. 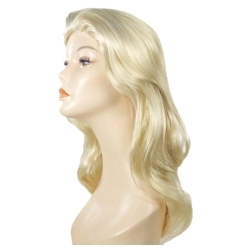 The Alice in Wonderland wig is available in light gray, medium blonde, or strawberry blonde. The wig features an elastic band for a comfortable and secure fit to almost any head size.